Lovely Swarovski Aurora Borealis 6-sided faceted Snowflake Star 30mm prism. Soft lovely rainbow colors to start your day off starry eyed. A superb Feng Shui crystal to enhance the energy flow and light play in any room. This prism is also used as a pendant in jewelry. Luscious colors in this charming Swarovski Aurora Borealis Crescent Moon hanging prism. Brighten up your home or office with magical rainbows. This prism is also used as a pendant in jewelry. Swarovski 38mm Aurora Borealis French Pendaloque prism. Beautifully faceted scalloped edges border a raised low center point on both sides, enhancing the rainbow reflections. A superb Feng Shui crystal to enhance the energy flow and light play in any room. 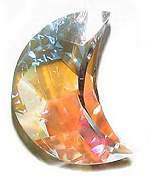 Swarovski 50mm Aurora Borealis Pear Shape prism. Spectacular faceted wide oval tear drop prism has a raised center point on both sides, narrowing down to the faceted edges. The rainbow reflections on this piece are especially luminous. A superb Feng Shui crystal that can enhance the energy flow in a dark space. This prism is also used as a pendant in jewelry. Wish on a star every day with this radiant Swarovski Aurora Borealis hanging Star prism. Soft lovely rainbow colors to start your day off starry eyed. This prism is also used as a pendant in jewelry. Dazzling big beautiful Swarovski Aurora Borealis Heart hanging prism. Let the rainbows melt your heart. This prism is also used as a pendant in jewelry. Gem like Octagon Aurora Borealis Swarovski 40mm prism is beautifully faceted to a raised center point on both sides, enhancing the rainbow reflections. A superb Feng Shui crystal that can enhance the energy flow in a dark space. This prism is also used as a pendant in jewelry. Swarovski 50mm Aurora Borealis Marquis prism. Beautifully faceted in the classic marquise diamond cut. A superb Feng Shui crystal to enhance the energy flow and light play in any room. 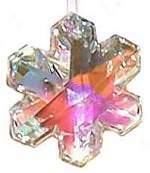 This prism is also used as a pendant in jewelry.